I wanted to photograph the Waibaidu Bridge across the mouth of Suzhou Creek in downtown Shanghai. It is a steel truss bridge that was built by the English in 1908. Unfortunately, after 100 years of use the bridge had been removed to Pudong for strengthening. It has since been restored, and photos and more information on this historic bridge can be obtained on Wikipedia as well as other websites. The next bridge upstream across Suzhou Creek is the Wusong Road Bridge. 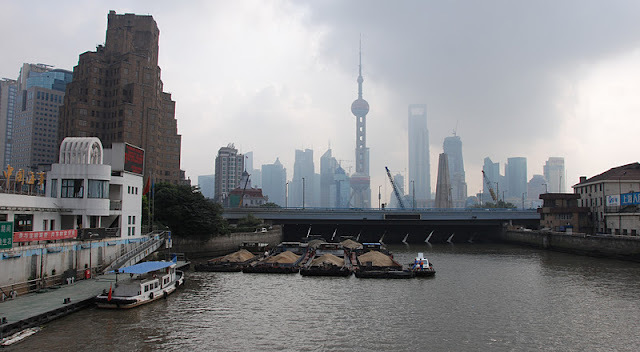 It is a steel girder bridge built in 1991 to carry the increased traffic along the Bund (the former international settlement in Shanghai) that the Waibaidu Bridge could no longer handle. However, the Wusong Road Bridge is supposed to be removed in 2011 after a tunnel is completed in the area. Anyway, this photo (looking east) shows the Monument to the People's Heroes as well as many famous structures across the Huangpu River in the Pudong District. Shanghai's Bridges: Wusong Road Bridge by Mark Yashinsky is licensed under a Creative Commons Attribution-NonCommercial-ShareAlike 3.0 United States License.